It is a simple country style version of an Italian favorite, enhanced by the shallots coriander blend, as the healthy Norcia lentils add their delicious nutty crunchy taste. Serve it as a dinner entrée with a fresh salad, or as a great side dish to a grilled chicken breast or lamb chops. Using a medium saucepan, add lentils and cold water, carrots and celery and laurel leaves. Cook as indicated: lentils should not be overcooked, taste them when close to cooking time to be done, drain and reserve. Meanwhile, in a medium saucepan bring the broth to boil. Chop shallots and mushrooms in small pieces. In a large heavy skillet, melt olive oil and 3 tablespoon of butter, at low heat, add shallots and mushrooms, cook till shallots are translucent (about 15 minutes), stir in nutmeg and coriander and cook for few minutes longer 3 to 4 min. Add rice and cook it in the mixture for about 2 minutes, when grains become transparent. Add broth till the liquid covers the rice shallots, mushrooms mixture, add salt and let it cook at reduced heat, till first liquid is absorbed. Add some more broth, cook checking frequently liquid levels for 17 to 20 minutes. 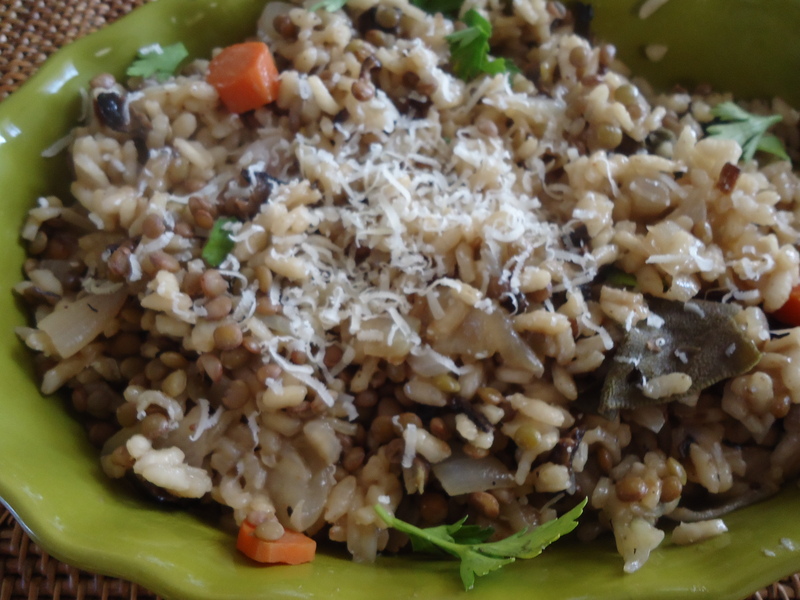 Just 2 minutes before risotto is done, add 1/2 cup of lentils, or more as you like. Stir. The risotto should not dry up and it is done when the last liquid has thickened as a sauce, but rice grains are still ‘al dente’. When risotto is done remove from heat, stir in 2 or 3 tablespoons of grated cheese, 1 tablespoon of butter at room temperature, if you like. Let it sit so the cheese is slowly absorbed bringing salty flavors to the rice: we call it in Italian, mantecare il risotto, then serve garnished with persil. We will use more lentils in a new recipe coming up tomorrow.